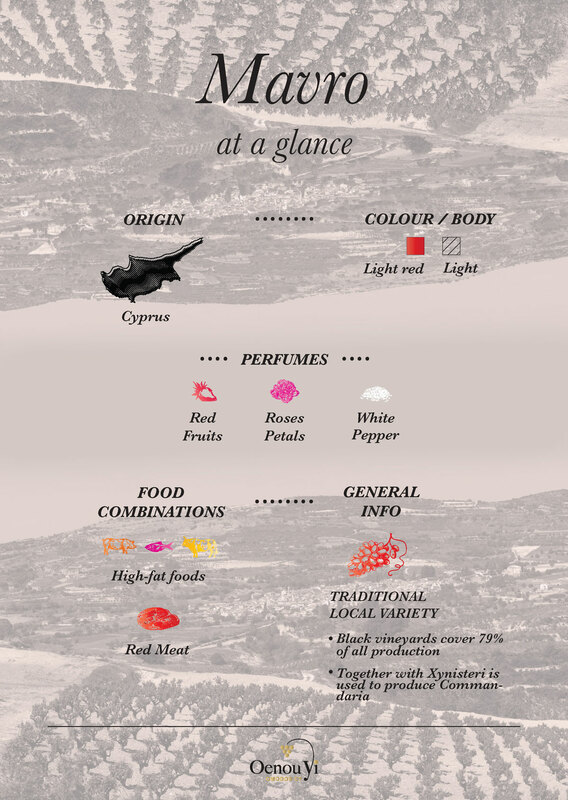 “Mavro” (meaning black) is a red variety that dominates the Cypriot vineyard. The name derives from the dark red colour of the grape. Mavro accounts for 79% of cultivated vines in Cyprus, covering some 14,000 hectares. This variety thrives in all soils, from the most fertile to the most barren. Mavro is blended with the Xynisteri variety for the production of Commandaria, a famous Cypriot dessert wine. This variety forms the basis for all red and black wine-producing vineyards and thrives on the plains that border on the sea as well as at the highest altitudes. Mavro has shoots which are white and fluffy at the top and steaked wine-red. The young leaves are pearly and yellowish, while the adult leaves are dark green, soft, with the edges slightly turning back. The clusters are very large, spread out, elongated, weighting up to 1 kg, fairly compact; the berries are very large, ovate, dark red; the skin is thick and the flesh very firm. As a rule its grapes once turned into wine in the usual process, produce balanced, slightly astringent wines, with a weak colour and aroma. With specialized winemaking procedures however, nowadays Mavro gives wines that are just as balanced with a fuller body, colour and nose, and which may be kept for 2-3 years. Mavro combines in harmony with red meat such as beef and lamb. For an even better match we suggest to cook these high flavour meats in red sauce or wine. A rich cut, such as prime rib, will also pair nicely with the bold and high tannin red wines that Mavro variety produces.